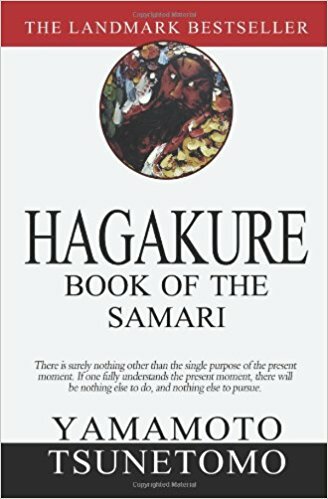 Hagakure: The Book of the Samurai - The Last Renaissance | What are the Questions? Hagakure ("In the Shadow of Leaves") is a manual for the samurai classes consisting of a series of short anecdotes and reflections that give both insight and instruction-in the philosophy and code of behavior that foster the true spirit of Bushido-the Way of the Warrior. It is not a book of philosophy as most would understand the word: it is a collection of thoughts and sayings recorded over a period of seven years, and as such covers a wide variety of subjects, often in no particular sequence. The work represents an attitude far removed from our modern pragmatism and materialism, and possesses an intuitive rather than rational appeal in its assertion that Bushido is a Way of Dying, and that only a samurai retainer prepared and willing to die at any moment can be totally true to his lord. While Hagakurewas for many years a secret text known only to the warrior vassals of the Hizen fief to which the author belonged, it later came to be recognized as a classic exposition of samurai thought and came to influence many subsequent generations, including Yukio Mishima.